PRP Chairman Hale T Pole, CEO Aayden Clarke with Manu Samoa capatin Chris Vui and board members Seilala Mapusua and Jack Lam during November 2017 tour team visit. Pacific Rugby Players – the official representative body of Pacific Island players across the globe – has announced former Tongan International Hale T Pole as its new Chairman with Aayden Clarke taking over as Chief Executive of the organisation. The appointments come as the organisation ramps up its work around tackling player welfare issues, working on the establishment of a Pacific Island Super Rugby team, an agent accreditation scheme with the International Rugby Players Association (IRPA) and other important areas that affect Pacific Island players. PRP, the collective voice of the Fijian, Samoa, Tongan and Cook Island players looks to ensure that both current and former players contribute to the success of Pacific Island Rugby both on and off the field. 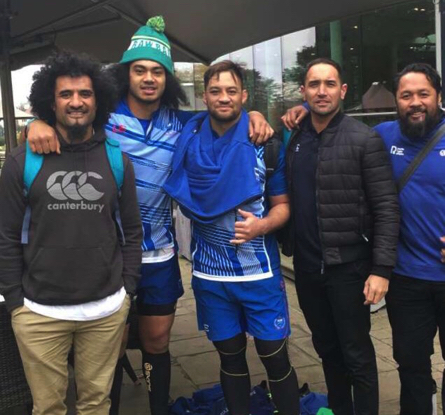 Both T-Pole, who played club Rugby in both hemispheres, and Clarke have also focused on the issues facing Pacific Islanders in Europe and this has resulted with two PRP Player Relationship Managers in UK and France to directly support players from the islands. Much of the work of Pacific Rugby Players ties in with the global body and IRPA Chief Executive Omar Hassanein says that both T-Pole and Clarke’s work will benefit Pacific players everywhere. “The issue of overseas agents and clubs recruiting young players from the Pacific under unfair and unrealistic terms has been central to many player welfare issues for years.